Chatrooms on the Community or Pro tiers are able to view IP Addresses associated with messages sent in the chatroom. 2 How is viewing IPs useful? 3 Is IP Address a fool-proof solution? To set it up, go to your Chat Settings page, and click "IP Addresses" under Premium Settings. Your chat must be on the Community or Pro chat tier in order to access this menu. Once here, you will see an option to enable the functionality, as well as the ability to change which rank can view IPs. This feature will be available as long as your chat is on the paid tier. Note: Only messages sent while this feature is turned on will have the IP Addresses available. For instance, if you turned it on right now, you could not view IP Addresses sent on older messages. How is viewing IPs useful? Each user is assigned an IP Address. If you suspect two people of being the same person, IP Addresses will help you investigate. Let's say a strange user entered your chat, and you suspect they may be that "Good User" you recently talked with. Viewing their IP may help confirm your suspicions. Once you click "View IP", a window pops up with the user's IP Address, as well as estimated location information. Estimated IP Address location information uses GeoLite2 data created by MaxMind, available from www.maxmind.com. This database is downloaded onto Minnit's servers, and processed entirely by Minnit. 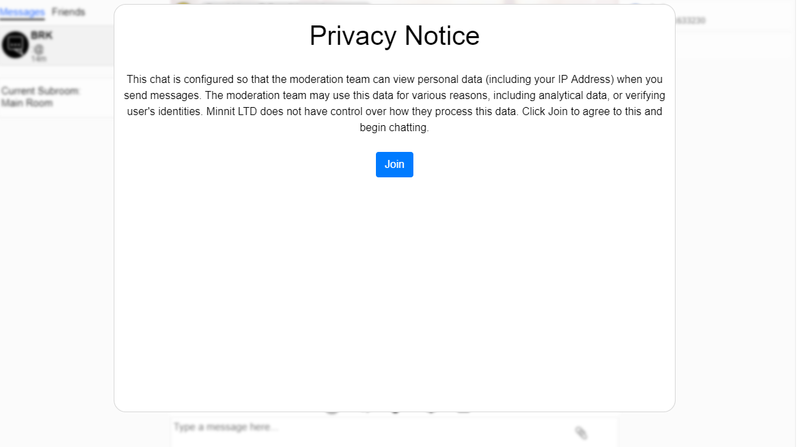 At no point does the personal information of you or your users get sent to MaxMind. Is IP Address a fool-proof solution? In some cases, no. For instance, if two users live near one another, and have chatted from the same coffee shop or library, they will have shared an IP. Many mobile data carriers will also share IPs. These may result in false-positives. Furthermore, false negatives are possible if a user only causes trouble on their cell phone on mobile data, and stays on their home network to behave themselves. They may also be using a VPN in order to mask their identity. IP Viewing should supplement human moderation and judgment, not replace it. When users join your chat link directly, they will see a full-screen message alerting them that you can view their IP. 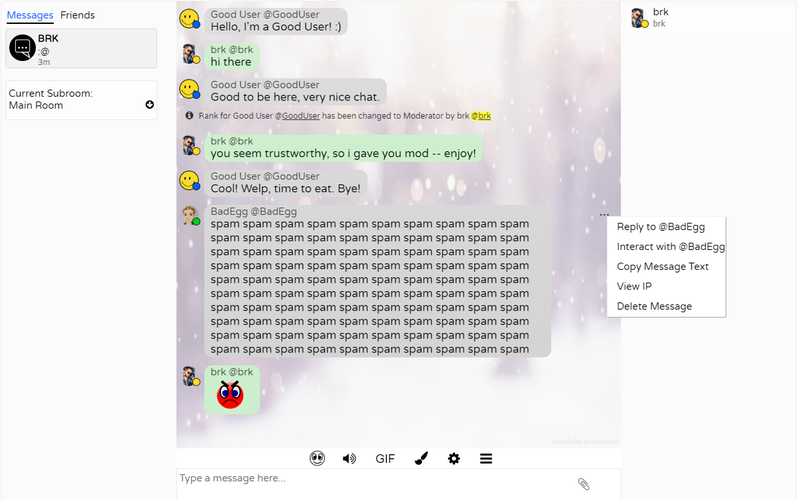 This message only appears if they visit your chat link directly -- if you have your chat embedded onto your own domain, this message will not display, as you already have access to their IP. You are not allowed to sell, re-distribute, or publicize IP Addresses. Any chats found to be engaging in this behavior, or threatening to do so, will be suspended from the service. IPs are only viewable on messages sent while this setting is On. You cannot view an IP Address associated with a message if the message was sent while the setting was disabled. 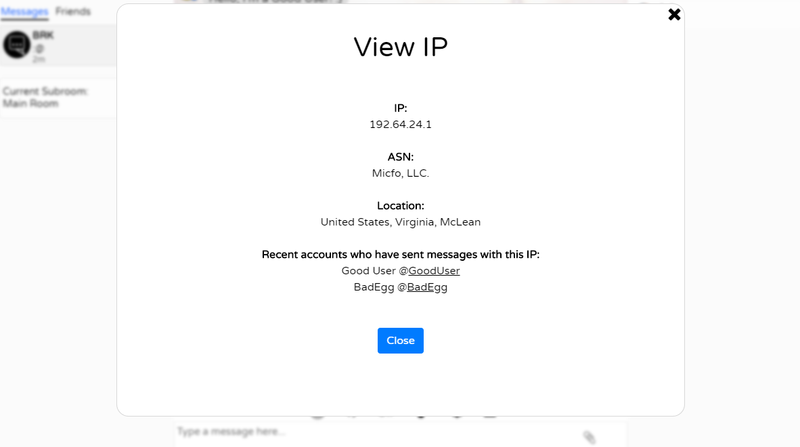 This is also true for "Recent Accounts" -- if @GoodUser talks on IP 123.456.789, and then you enable it after they leave, and @BadEgg appears on 123.456.789, the system will not show you that they share IP Addresses. This page was last edited on 8 April 2019, at 22:08.